England face Belgium on Saturday's 3rd place play-off and bookmakers are expecting a high-scoring match. Fancy the Three Lions to score a goal? Claim a tasty 20/1 England to score vs Belgium at Ladbrokes + £5 free bet if they don't find the back of the net! England's World Cup title dream ended on Wednesday evening and this is the last chance to make a good profit on the Three Lions' campaign. Don't miss the chance to make a £20 profit by staking just £1 on England to score vs Belgium! Ladbrokes offer 20/1 England to score vs Belgium + £5 free bet! Open a new account with Ladbrokes before the kick-off (3.00pm UK Time) and claim 20/1 England to score in the FIFA World Cup 3rd place play-off against Belgium - What a massive bargain!! If England score a goal, Ladbrokes will settle your bet at the original price immediately. They will top up your additional winnings within 24 hours. Should your bet lose, Ladbrokes will refund you with a £5 free bet! Get 20/1 England to beat Belgium with Betfair! New Customers can get England at an enhanced 20/1 to beat Belgium. Max Stake £1. Winnings paid in free bets, valid for 7 days, only deposits with cards/Paypal count. Exchange and multiple bets excluded. T&C’s Apply. 18+|Gamble Aware. Coral offer 20/1 England to win vs Belgium in 90 mins + £5 free bet! England have set a record for the most set-piece goals at a World Cup since 1966. Harry Kane has scored five goals in his first two games of Russia 2018 and, ahead of the 3rd palce play-off, has six strikes to his name. The Three Lions have only failed to score only once this year, against Belgium in the final group stage match. But Southgate rested all his key players in that game. England to score a goal is normally backable at 1/4, 20/1 if you claim this enhanced offer! 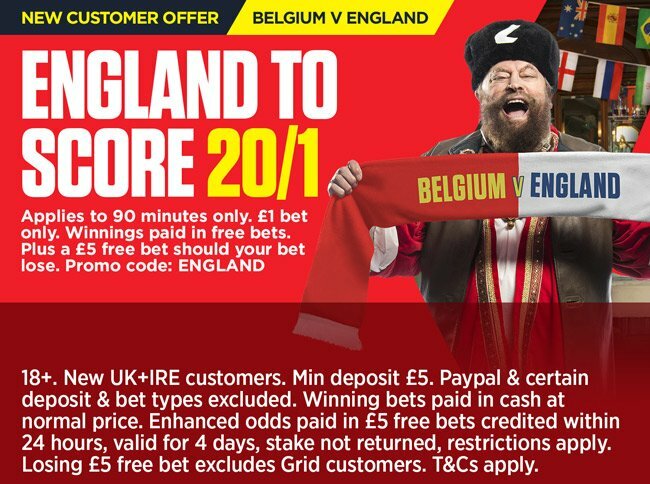 Ladbrokes are offering all new customers a huge promotion of 20/1 England to score vs Belgium, click here to get your crazy price in less than two minutes! This promotion is open to customers opening their account from United Kingdom and Republic of Ireland, aged 18 years or above. The promotion is valid until 16:00 14/7/2018 UK Time. Max bet €/£1. If England score a goal in 90 mins your first bet on England to score will be paid at 20/1. If England fail to score, Ladbrokes will instantly credit your account with a £/€5 free bet. Free bets must be used withing 4 days and can't be redeemed for cash at any time. The value of your free bet will not be included in any winnings. Payment restrictions apply. Eg. Moneybookers, Paypal, Paysafe, Neteller or Skrill deposits are not eligible. Please use credit or debit cards. Cash Out of winning bets voids the enhanced odds offer. 18+ Full terms & conditions apply. "Get 20/1 England to score vs Belgium at Ladbrokes + £5 free bet"